In general, we think user assistance is of relevance only after the product is being sold and when the end user gets started with the product. Can we limit ourselves to guides that we create after the product is sold when the market or business world is craving for quick, easy, creative approach to IT products that are being developed? Customers are eager to make sure that they sign up only for products that help them in their business.User assistance can make a big difference here by thinking of ways to tell the customers in short about our product and its capabilities even before it is being sold. 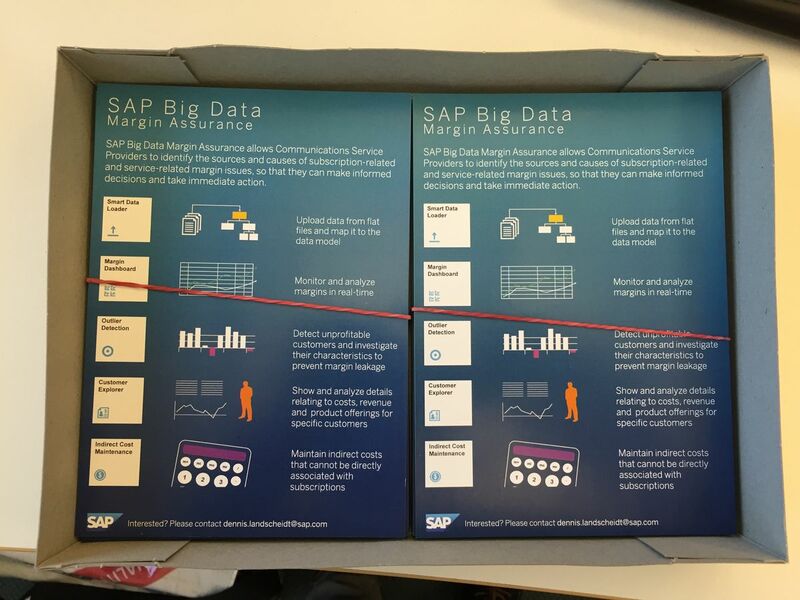 The Telco Big Data User Assistance team came up with an idea to contribute to the demo version of SAP Big Data Margin Assurance, the new big data analytical product for telecommunications. In this article, I share our experience of having tried this approach in collaboration with experts like graphics specialist. We picked the idea of coming up with an infogrpahic to introduce the product to the prospective customers creatively by converting the complex information into an appealing combination of appropriate images and words. 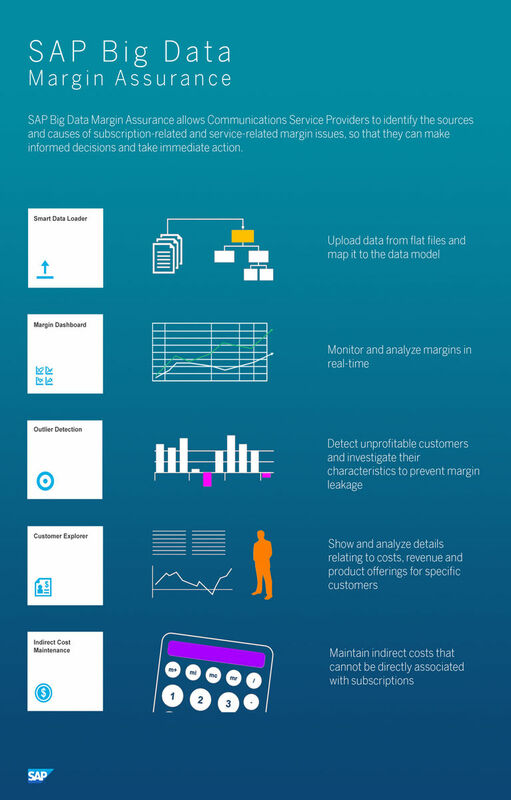 We shared an initial draft of the conceptual information about the product with our graphic specialist, who later gave an appropriate form to the idea and thus our infographics was created for SAP Big Data Margin Assurance. We took some time to script suitable words for each of the the images in the infographic that summed up our product and various components associated with it. Through right selection of layout, icons, color, font great care was taken to ensure that the infographic confirmed to the SAP Brand Voice guidelines for images. We used this infographic as a flyer (Size A5) to showcase and spread a word about our product to customers in Mobile World Congress 2016. The infographic includes a miniature portrayal of actual applications (5) in the launchpad, an image that aligns with the app function, and textual description of what you can do with each app. Why We Feel Special About It? We conceptualized this infographic by using the people-centric approach (PCA), which is an approach unique to SAP User Assistance. PCA emphasizes on how to approach an IT product from user perspective. In our infographic, each image is associated with the function it is designed for so that a layman can easily understand quickly. We feel good that we have optimized User Assistance for the demo experience with our humble contribution, keeping in mind the significance of the visual appeal to the end user. An article on how even user assistance can make a difference to the demo version of the product by influencing the decisions of the prospective customers has been the source of inspiration. Remember, this kind of assistance is in addition to the marketing team’s initiatives. We always look for usability when we want to decide on a product. Thus user assistance has relevance and significance even before the product is being sold. We feel proud we implemented an idea that was favorable for the demo version of our product. Initially we were not sure if we could proceed with it because user assistance support to the demo version has not been an established norm as such. But somehow we kept our resolve to go ahead and make it a reality, considering our early involvement in supporting the product to win potential customers. We did it. Finally around 200 copies were printed for Mobile World Congress 2016. User Assistance should focus on extending user centric approach and creativity to the product in its budding stage and not wait just to write guides for the product after it is being sold. This experience shared is just one of the many possibilities that can be tried out. Winning customers for our product should also be our goal in addition to the efforts by marketing colleagues. Help the product early on when it is being showcased and not just after it is being sold and thus leave a good business impact.